Not too many people are willing to do what the rich do and continuously do to achieve such a high economic status. And yes… most people are just too busy to get rich; if you searched for “things rich people do” and found this article, you may just be one of those who are going to if you continue on this journey regardless of all the roadblocks. As humans, we’re all born with some sort of negative mindset. This is the reason why most people fail to succeed. Most people, talk themselves out from even trying something that could potentially change their lives because of fear of failure. Rich people fights this negativity by associating themselves with the rich or at least those who are in the same journey. They also condition their minds for consistent positivity and motivation through meditation, reading, watching and listening to motivational speeches and pieces. The poor and the middle class stops learning after they graduate from school thinking that they’ve learned all they need to learn from school. After all, school prepares us for a better future, right? Wrong… school is just a training ground for a lifelong learning. We learn how to learn from school. That’s it. School teaches you the skills and knowledge you need to work at a job. If you stop learning after graduating from school, you will remain poor all your life. This is what’s happening to most people around the world and they wonder why they seemed to be destined for a lifetime of poverty. The rich understands that the more they learn about money, business and personal development, the richer they become. Intellectual and personal growth therefore are correlative to financial success. So does this mean that the rich goes back to school after they finish school? Well, not necessarily but the rich learns in many and various ways. Constantly reading books, entrepreneur blogs, listening to podcasts and watching online videos about personal finance, money, business and personal development makes the rich richer. It’s about enriching one’s mind, no matter how you consume content. Learning from one’s failure is also a great way to learn and if you’ve never tried to venture on a business startup, you may never learn the valuable lessons a business failure rewards you. If you want to get rich, you have to understand how important time is to your success. Only poor people “kill time”. If you kill time, you kill money! The rich are always productive. They don’t waste their time on unnecessary activities. In other words, don’t waste time! Time is the most valuable thing in the world. Don’t waste yours on unproductive activities if you want to get wealthy. The rich respects and nurtures good health by eating the right food, dieting and having a consistent work out routine. It’s been proven that running pumps up more oxygen to one’s brain and you would probably know what results to having more oxygen in your brain, right? Good food and good exercise helps us perform better, not only physically but mentally as well. If you have a healthy body, you perform at your peak! Hence, the reason why the rich gets rich because their bodies and brains allows them to perform better than those who don’t exercise or eat a healthy diet on a regular basis. It’s been established that a person’s TV time is directly correlated to their income and on average most families with low income watch at least 5 hours a day of TV on a daily basis. I’m not saying that you shouldn’t watch TV but you have to cut down on your watch hours and instead dedicate more time on working or learning to improve ones’ financial situation. “Your nine-to-five makes you a living. Your five-to-nine makes you a fortune”. For the poor and most middle class, their work hours is eight hours for 5 times a week with an hour or two of over-time. The poor waste at least 4 hours a day in front of the TV until they drowse off to bed. A good 4 hours which otherwise would have been spent on a side hustle that can increase one’s income or build a sustainable business. In the world of the wealthy, there’s no shortage as they practice the abundance mentality. This does not mean that the rich spends more than what they make but what they focus more is on how they can increase their income than budgeting a little amount of salary that most poor people do. Instead of being contented with once source of income, the rich focus on developing multiple streams of income by developing businesses that could provide them with income streams even when they’re not actively working on these businesses. While the poor and the middle class race on spending their hard earned money on the latest and biggest smart TVs, the most expensive cars and the biggest family home they can afford, the rich re-invests their profits on their business or buy assets like stocks or income properties. You have to understand that money are your economic soldiers, you have to send them out to get more soldiers who will fight for your economic success. You don’t send them back to die right away the moment you acquired them. For most people, they liquidate their money outright in exchange of things they don’t really need. Rich people prefers to get paid based on their performance and not by the hour. An hourly price for their labor. They love the idea of being paid on a bi-weekly basis for the hours they “timed-in” on the punch clock whether or not they performed at their utmost in the time-frame they were paid for. I’m sure you would agree that “some” of your co-workers actually just report to work to “punch the clock” and literally watch the clock and wait ’till their shift is done. If you want to get rich, don’t brush off pay for performance opportunities. This are the kinds of jobs that will make you rich. In essence these are businesses though some people call them jobs. Most pay for performance jobs are in the realm of sales and marketing. Yes, I know, it’s cold and a bit scary at times, specially when you’re just getting started. But when you get the hang of it, it pays well! It pays very well, actually, way more than you could ever earn in any salaried position(s) as it gives you more control. That’s why the rich loves it! In commission only sales, there’s really no limit on how much you could earn if you’re willing to work for it. If you know yourself and you know that you’re capable of achieving things. Pay per performance is the cheapest business that you can start! Rich people are not afraid to fail. Well, it’s always scary the first time but you don’t succeed if you don’t try. So, do it scared anyway! It’s not because they already had the money so they can afford to fail. Those who get rich understands the risks and rewards of failure. And I’m not talking about the born-rich here. I’m talking about the bunch of people who are crazy enough to think that not only can they change their lives but the world. People who have such bigger why’s than their excuses. These are the rags to riches stories. Not the get rich quick type but those who have endured failures and came out rich after the multiple horror stories that would have caused heart attacks everywhere. The rich or at least, those who are rich in their minds (already) are not afraid to fail. As I mentioned above, most people don’t even try due to fear of failure. If you want to get rich, you have to learn how to take calculated risks. Understand the fact that it’s okay to fail because when you fail, you gained experience and you learn from those failures. Failing is the best way to learn. You know why? Lessons learned from failures are lessons that you will never forget! So fail early, fail forward, as much as you can, the earlier in life, the better and learn from every mistake and failure as they will bring you closer to success. The truth about failure is that it’s no one else’s fault but ours. The rich takes accountability of their failures and don’t point fingers or pass the bucket to someone else. Yes, everyone fails, not just you and yes, the self-made millionaires failed so many times in their lives and learned from every bit of those failures. Their failures equipped them with the necessary skills and lessons to become wealthy. The poor and the middle class on the other hand, fear failure and are too contented to stay in their comfort zones. And when they fail, they bail themselves out by blaming others. This is a typical employee mentality… Pass the bucket and blame it all to others! The rich don’t treat themselves as victims of circumstances, they learn from their mistakes and get better. If you want to get rich, you have to take accountability. You have to bet on yourself and as mentioned above; it’s okay to fail. You just have to learn from it and don’t blame your failures to others. This is called “being responsible”. The great thing about success and financial freedom is it leaves a trail. Studying the teachings and the lives of other successful people makes one equally successful. The rich loves associating themselves with other successful people this is because of the fact that you are the average of the five people you surround yourself with. Now, if you can’t find other motivated / successful people in your offline community that you can surround yourself with, look online; connect or follow successful people on social media, read personal finance and entrepreneurial blogs like this and study the rich closely and emulate their habits as your own. 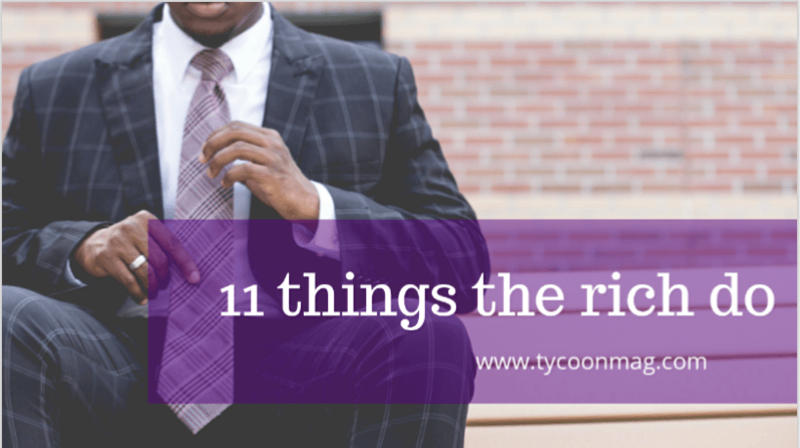 11 things rich people do that the poor and the middle class don’t. Hope you’ve learned some tips in this article to help fuel your journey to financial freedom! If you’ve found value in this article please share it with others who may also benefit from this article.